Anna Black believes we can see our essential nature as the blue sky and our experience, good and bad, simply as impersonal weather that obscures it from time to time. We can’t stop the difficult times occurring but we can help ourselves move through them by connecting with our essential nature through mindfulness. 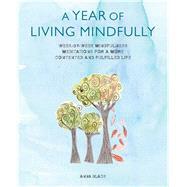 In A Year of Living Mindfully Anna helps you to gradually integrate mindfulness into your everyday life. Week by week it suggests different activities and meditations to cultivate present moment awareness. The emphasis is on progressing at your own pace and cultivating a spirit of curiosity about the moments that make up your life. There is plenty of space to reflect on your experience and what you are discovering. Anna suggests ways to actively cultivate qualities that build our emotional resilience in the same way we may exercise to improve our physical fitness. We can learn to handle difficult emotions more positively and learn to respond to our experience rather than being hijacked by it. Anna Black is a highly qualified mindfulness practitioner, who teaches mindfulness workshops and trains other teachers. Anna has a Masters in Mindfulness-based Approaches to Health and has completed the Advanced Teacher Development Intensive run by teachers from the North Wales Centre for Mindfulness and from the Center for Mindfulness at the University of Massachusetts Hospital, USA. She is the author of Living in the Moment, Mindfulness at Work, and The Little Pocket Book of Mindfulness. Anna has an established personal practice in mindfulness and meditation–visit www.mindfulness-meditation-now.com. Anna is based in London, UK.